Review: The FT for Android tablets – is the £233 app as premium as it could be? When looking at the app of a magazine or paper, it’s sometimes hard to separate the quality of the content from the quality of the format. And that’s a good thing. Ideally, you shouldn’t notice the format at all because it’s so intuitive that it unobtrusively lets the content shine. But when reviewing it, you have to poke around and look at this stuff closely. 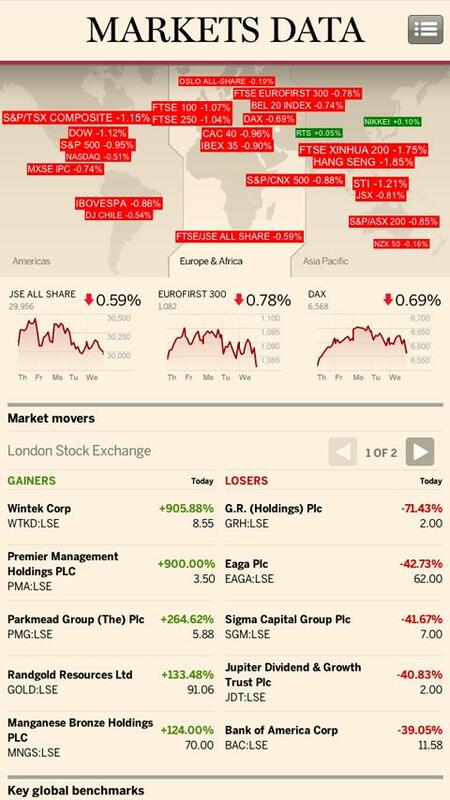 So I’ve been putting the FT’s Android app through its paces. The FT have just made a stab at reproducing their newspaper content in an Android app, just under a year after they launched their iPad app. I tested it out on the Samsung Galaxy Tab. Does the Android one stand up to that? We explored. The Android app comes bundled with a Standard digital subscription at £4.49 per week or a Premium online subscription £6.49 per week (£233 or £337 per year). Just like the paper version of the FT – it’s a lengthy, serious read. And the length of the articles is accommodated by long scroll-down pages and clean single column of pleasant lightly-serifed text – it shows up cleanly on the off-white of the page. There are no bells and whistles Wired-style here – no interactive graphs of markets data or globes that spin round or anything. It’s all a bit more low-key. This means they avoided gimmicks but also possibly missed out on some opportunities for a wow-factor. The front page is the home page and the hub of the whole experience.. The front page worked very well, but I found going deeper to be a little bit less intuitive. The menu for different sections was a line of grey boxes at the top – that you open up by clicking on a small lined box in the top right-hand corner. Not the most intuitive or attractive lead-on to further stories.. Videos were forefronted on the main page, which was great, though the quality was a little hazy despite being on a full wifi connection.. Given the nice screens on these tablet devices, video really could be – and should be excellent. With the pictures – again the visuals were a little lacking here. There were nice photos attached to stories, but they never get any bigger than thumbnails. On stories in the fashion or arts section for example it would great to have galleries and pictures that blew up to the full frame. 1) Landscape mode didn’t work. This was a gripe for me. At first I didn’t notice, because it is easy to read in portrait mode, but once I had, I kept wanting to turn it round. This was particularly the case after watching a video which automatically displayed in landscape. 2) Comment functionality would be nice too.. as would sharing. There is some link to Google on the top left of individual article pages, but a quick way to grab a link would be nice – even if only for personal reference. Paywalls inhibit the sharing of stories to Facebook and Twitter of course. 3) This is a paid-for subscription app, so I really didn’t see why there should be a little strip ad at the bottom of pages. Sure it isn’t very big, but it took up screen real estate and occasionally covered up useful links. A nice app that does a functional job and was clear and pleasant to read. It didn’t really have a tablet wow-factor for me, but they probably just want to leave that to the content in line with the FT’s character. Visuals should be improved and perhaps that top menu bar too. Certainly riding at over £200 a year you’d expect a really premium experience and so the pictures and videos as well as the text need to be top notch. 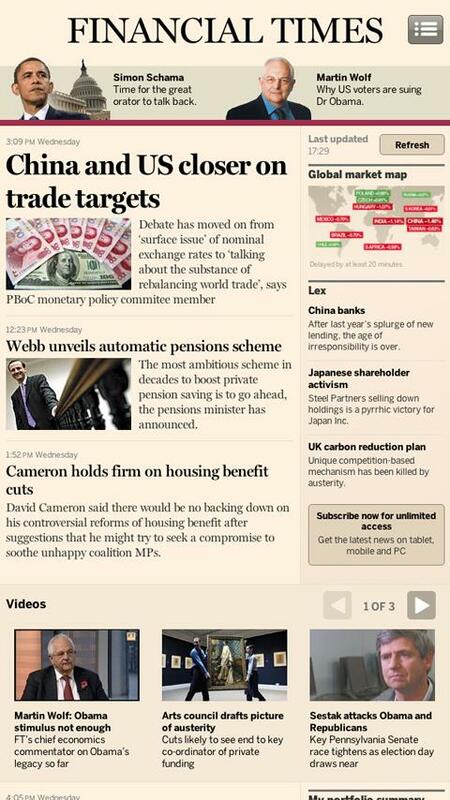 But tablets are great for reading long denser articles and the FT is full of valuable long dense articles. It really comes down to the money – do you want to spend £233 a year on one paper? If you do, and have an Android tablet, well this is a nice additional way to read it.